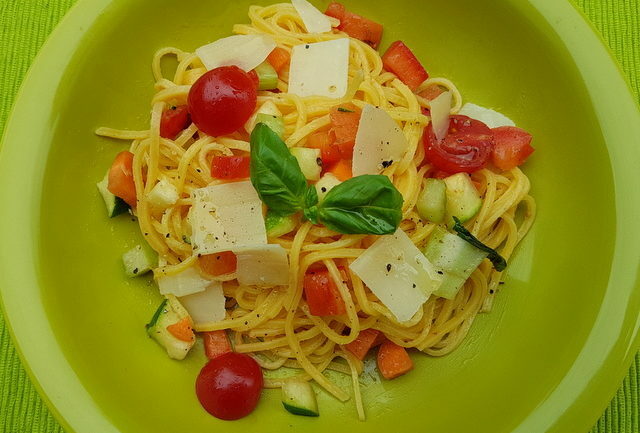 Summer Tagliolini Pasta Recipe with marinated vegetables. 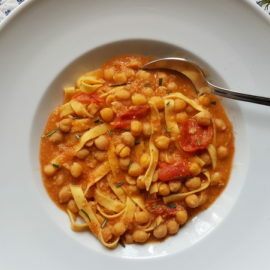 This light summer tagliolini pasta recipe from a restaurant in Bologna is so tasty, fresh and healthy. It’s also has a no-cook sauce, meaning all you have to cook is the pasta. 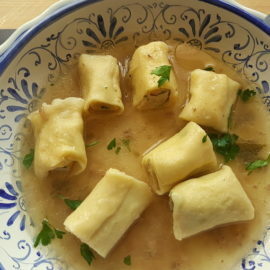 I first came across this recipe in a huge Italian recipe book I bought last year. This book has 5,000 regional recipes. Not all are pasta, of course, but there are a lot of delicious sounding pasta dishes in it that I want to make! 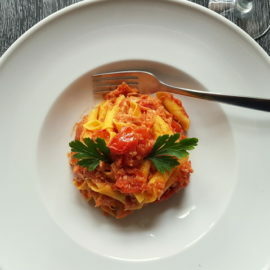 According to the author of the above mentioned book, this summer tagliolini recipe was invented by Irene Diolaiti, the owner of Da Cesari restaurant in Bologna, Emilia-Romagna. I looked up the restaurant on the Internet and found a photo of this dish in their photo gallery. It looked so good, I decided to give it a try! 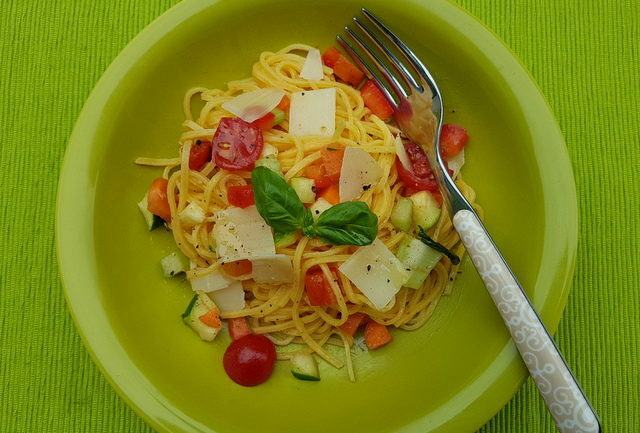 This isn’t a typical summer pasta salad recipe because it’s made with fresh tagliolini. Most pasta salads or ‘pasta fredda’ as the Italians say, are made with short pasta types. However, tagliolini is a long narrow egg pasta that’s usually eaten fresh and is popular in Emilia Romagna, Liguria, Piedmont and Molise. I have one other summer pasta recipe here on the Pasta Project that’s similar to this recipe. Vermicelli di Positano is made with a long pasta (vermicelli) and the condiment is marinated raw veggies and herbs. 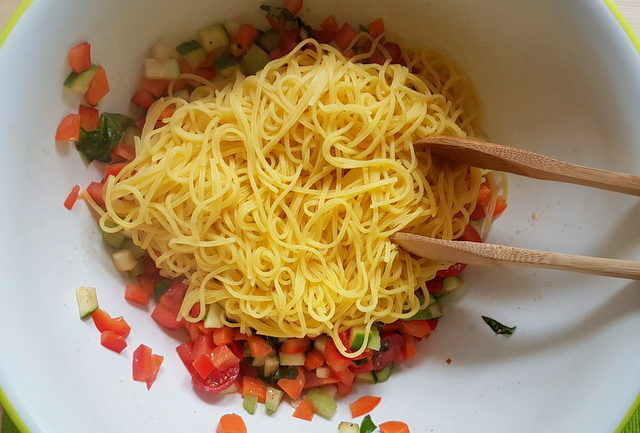 The main difference between the two dishes is that this summer tagliolini recipe has a greater variety of raw veggies, whilst the vermicelli recipe has more herbs. Both are delicious! This summer tagliolini pasta recipe is brilliant for really warm days when you just can’t face standing over a hot stove! It is fresh, tasty and healthy! Some of the raw veggies also add a bit of crunch to the dish! Because the vegetables are only marinated, I chose to buy organic veggies. 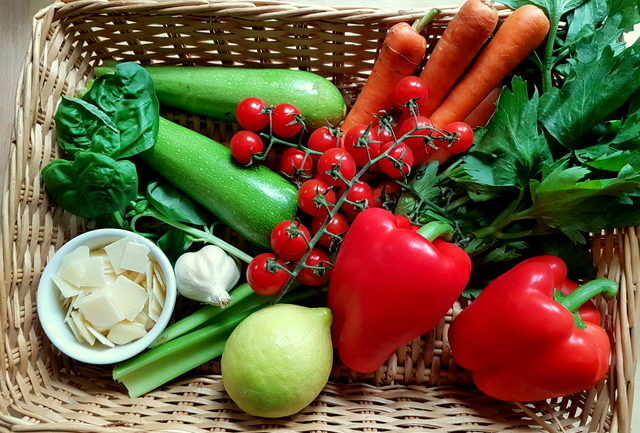 Here in Italy, organic vegetables and fruit are more expensive than the normal ones available in supermarkets. But, when it comes to eating raw, I prefer to use them. Also organic veg tastes better in my opinion. 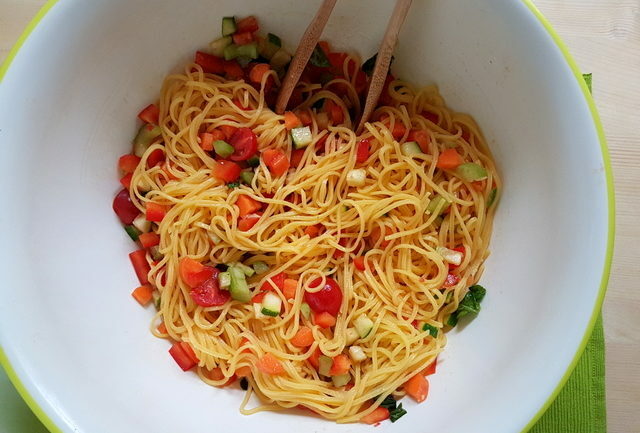 This summer tagliolini pasta recipe has fresh cherry tomatoes, zucchini, carrots, celery and red bell peppers, all cut into small cubes. There’s garlic, basil and lemon juice to add more flavour and I marinated everything in very good extra virgin olive oil for an hour before mixing the pasta with the vegetables. The other step that adds flavour to this recipe is that the pasta is cooked in beef broth. You can use vegetable broth to keep it vegetarian. I used homemade beef broth. However, a good ready-made stock cube added to the pasta water would add extra flavour too! Fresh tagliolini is the pasta of choice for this recipe. 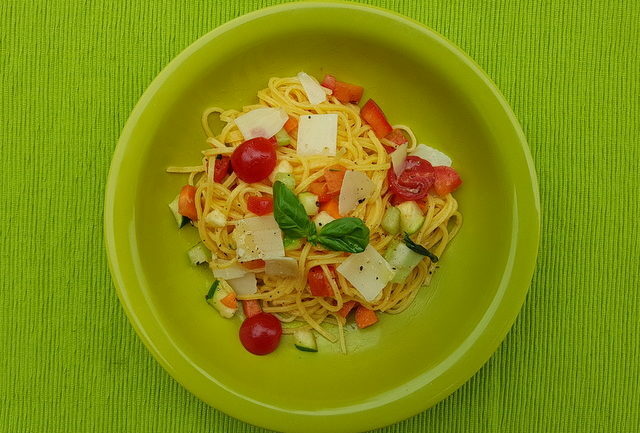 But, you can make it with dried pasta such as spaghetti, vermicelli or linguine. Fresh fettuccine would be a good option as well. If you want to save this summer tagliolini recipe for later, you can print it, bookmark this page or save it to Pinterest. This summer tagliolini recipe is brilliant for hot days when you just can’t face standing over a hot stove! It is fresh, tasty and healthy and very easy to make! 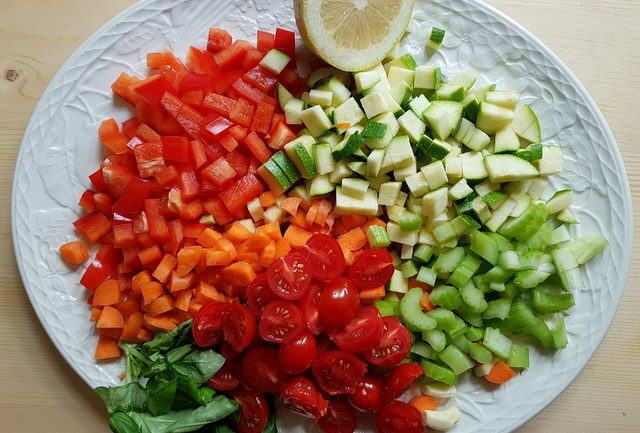 Wash all the vegetables and then cut into cubes. Mix well, cover with cling film and marinate for an hour. Add the drained pasta to the bowl with the marinated vegetables. 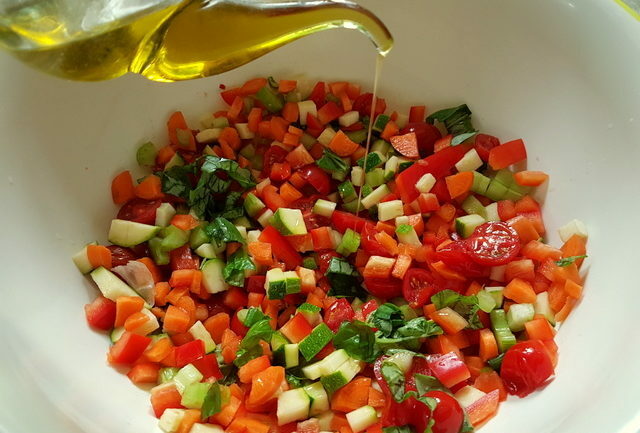 Then add a little more olive oil and mix together well. Add salt and pepper to taste if required. Sprinkle with Parmesan flakes and serve immediately. This dish should be tepid. The vegetables for this recipe can be changed as desired. For example, you can add spring onions, radishes, raw fennel, and peas, green beans cut into small pieces, asparagus spears and blanched artichoke slices. Fresh tagliolini is the pasta of choice for this recipe, but you can make it with dried pasta such as spaghetti, vermicelli or linguine. Fresh fettuccine would be a good option as well. This tagliolini pasta will make the perfect lunch on a hot summer day. I love the fresh flavors this pasta dish has to offer. Thank you Kelly! I agree! This is a great summer pasta recipe! I love recipe that only requires fresh ingredients. And I can say this is my favorite already! Aww thank you Linda! Yes, this is a very fresh pasta recipe. I love that the veggies are just marinated and not cooked! Perfect for summer! I love this fresh and summery twist on a typically heavy pasta dish. Perfect for the hot days ahead of us!! Thank you! Me too Heather! This pasta recipe really is a great summer dish. As you say it’s light, whereas pasta can sometimes be heavy! This looks so light and refreshing! How perfect for these hot, heavy summer days! Thanks so much Stephanie! Yes this really is light and refreshing! A great summer pasta recipe! I agree, we’re lucky here in Italy to have so many pasta cuts! Tagliolini is one of my favourite long pasta types. But, yes, this recipe can be made with spaghetti. I think it would be just as good! Grazie Theresa! 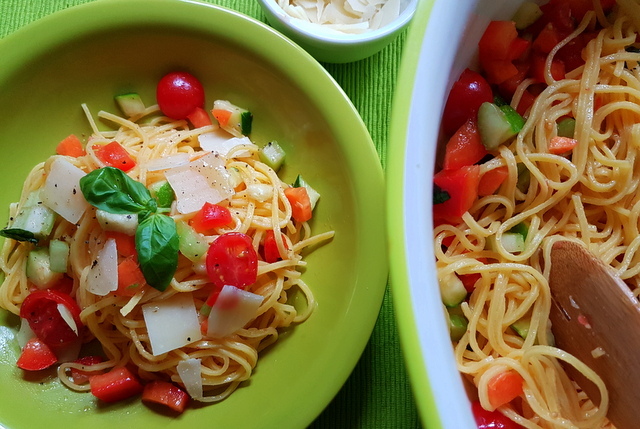 If you like pasta but want a lighter recipe for summer, this one is, as you say, perfect! Looks like a great summer meal! Light and healthy with lots of veggies!! Okay, I am LOVING the marinated veggies. What a great summer meal. I would love this for dinner any night of the week. Perfect for a nice summer meal on the patio, with a glass of white wine. Fantastic pasta! 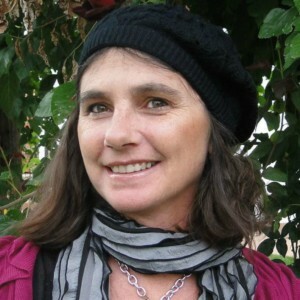 Organic food is pretty expensive but with the recipes like this it totally pays off!